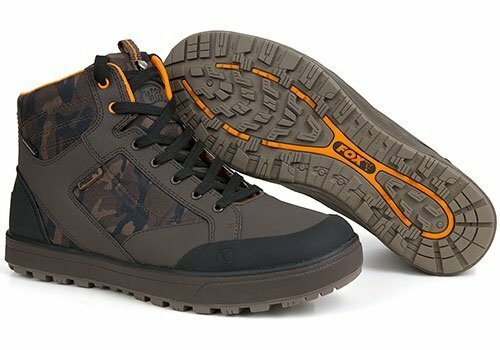 Fox have taken their first steps into the angling footwear market with a concise range of Chunk boots and trainers, The aim with this footwear is the same as the rest of the Fox Chunk range - to mix style with practical functionality. • Hardwearing soles • Waterproof fabric • Features unique Fox Camo pattern • Offers support to your ankles • Comfortable fit • Reinforced toe section • Reinforced rear kick plate for easy removal • Fold and Fix tongues can be fixed down to make it very easy to slip the boot on when you get a biteFishing boots from Fox. Fold over tongue for ease when putting on. Material: outer material: leather, textiles. Lining: textile. Insole: textile. Outer sole: other material.